Tap water contains chemicals and contaminants that could be harmful to anybody’s body. There are a lot of options out there on how you can filter your ordinary water to healthy drinking water. If you choose to use refrigerator for your drinking water and ice, then you would need to install a filter. 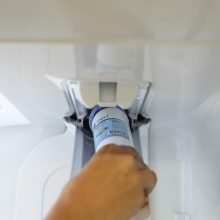 Installing a water filter for your refrigerator can increase the chances to eliminate any parasites, sediments, bacteria or contaminants usually found in tap water. This can then result to safer water with clean taste for your whole family. Many refrigerators nowadays are made with built-in filtration system that automatically filters water that is coming in to make drinking water and ice. This makes it easier for consumers to have clean water because they won’t need to buy and install any filters anymore. You can choose a filtration system that you may think is more effective and efficient. You also have the option to choose a filtration system that fits your budget and will go along with your refrigerator well. The first thing you need to do is to disconnect the line of supply on your refrigerator and turn off the valve. On the supply line, mark the width of the filter and cut it out. In small increments, tighten your refrigerator’s pipe cutter so that you won’t pinch the tube of the soft copper. Using a utility knife, cut off the plastic tubing. Now using your file, deburr the cut end. The next thing that you need to do is to slip the ferrule and the brass nut into the fittings of the tubes. Thread until finger tight the brass nut to the fittings and using two wrenches, twist it in a one full turn to ensure stability. In the supply side, snap the filter into place. Check if the indicator of the water flow is pointing towards your fridge. Hold the filter and slowly turn on the water on your shutoff valve until you see water coming out from the unhooked end. Using a 1-1/4 inch screw, hang a bucket on your wall to catch the outgoing water from the filtration system. Leave it there for about five minutes to ensure that the next water is clean and free from any dirt or debris. If any leaks occur, tighten the fittings and nuts. After such, snap the other fitting in its place. Always remember to write the date you installed your water filtration system and replace it once every six months. Ensure that the filtration that you install is compatible with your refrigerator and that it doesn’t have any leaks or damages. When you’re looking for a water filtration system, make sure that you read the manufacturer’s notes on how to install them on your refrigerator. And also, ensure that they have cartridges on their filters so that you can easily change them after six months.